“Tell Your Senator No on Kavanaugh” were the words imprinted on designer Jeremy Scott’s sleeveless white T-shirt as he strutted down the runway at his opening show for this year’s New York Fashion Week. Under the slogan was the complete phone number for an office in Washington D.C that receives calls from people expressing their disgust with the current administration. Scott wore the statement tee at his Spring 2019 runway show on Thursday night. Scott's t-shirt wasn't the only political piece in his newest collection. Jackets and sweaters covered in neon words like, "RESIST," "PEACE," "REVOLT," and "HOPE" were worn by both male and female models on the runway. 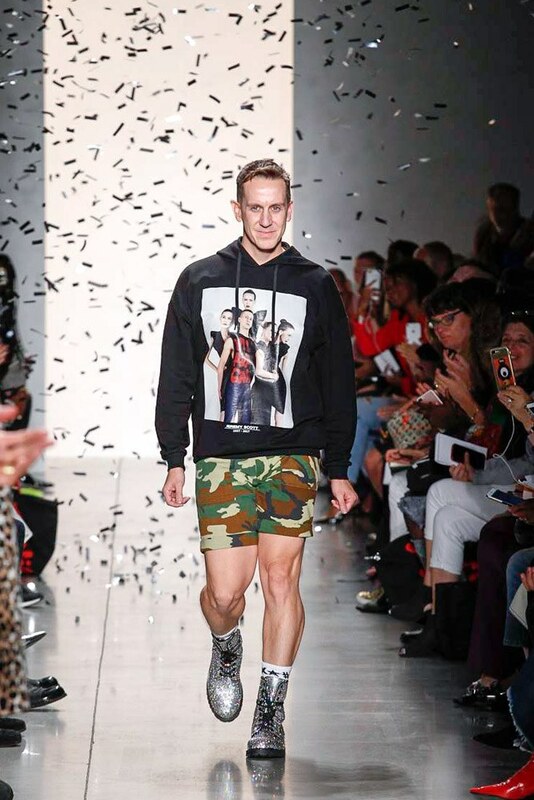 His shirt, however, which made its appearance when Jeremy Scott took his final bow, was the only piece that had a specific call to action. Scott’s statement tee is not the first. In recent years high fashion has fully embraced the types of buzzwords we see today. In 2016, Dior featured the now famous “We Should All be Feminists” T-shirt designed by for Maria Grazia Chiuri’s debut. Prabal Gurung famously did it with his “This Is What a Feminist Looks Like” T-shirt at his Fall/Winter 2017 show, as did Jonathan Simkhai wearing a “Feminist AF” T-shirt the same year. Making liberal political statements on the runway has been normalized, and feminism has become fashionable. But Scott’s T-shirt is unique in its call to action and timeliness. With the primary election only days away, Cinthia will challenge longtime New York Governor Andrew Cuomo for the Democratic nomination. As with Scott, Siriano’s statements had a call to action and an element of timeliness. Siriano is no stranger to political statements –– he’s one of the many designers who refuses to dress Melania Trump because of her husband. Siriano is in good company with designers like Zac Posen, Marc Jacobs, Tom Ford, Sophie Theallet, Phillip Lim, Derek Lam and Naeem Khan, who have all made similar statements regarding dressing the First Lady. Jeremy Scott has also been openly critical of the First Lady. When asked by Harper’s Bazaar if he would ever dress her, he responded, “To be frank, I don't feel like I do clothes that are appropriate for her. It's hard to know where she stands. Is she an ally of the gays? I don't know. At some point, she does need to stand up and say something because by default she'll end up aligning herself with him.” Later in the interview he spoke passionately about using his designs for activism, “I have to use my platform – we can't ignore what's going on." Political statements – especially those that are left-leaning – are no stranger to the runway, but this marks the first year where we are seeing designers urge people to take action … immediately.